OPENS WORLDWIDE THIS 24th OF SEPTEMBER SO CATCH IT WHEN IT OPENS! IF IT DOESN'T OPEN ON THE 24th WHERE YOU ARE FIND OUT WHEN HERE. According to IMDB the first movie came out on September 28th, 2012 and it eventually received a rating of 7.1 out of 10. Rotten Tomatoes' Tomatometer on the other hand gave it a total of 44% with an average rating of 5.3 out of 10 and the Audience Score of 72% with an average rating of 3.9 out of 5. I didn't have this blog back then so I can't say what rating I gave it and there's little point in my rating it now since I don't remember much about it other than it was a pretty funny film that would entertain kids and adults who are still kids at heart. Back at the helm of the sequel is Genndy Tartakovsky who back in the day worked on or created such classics and cult favorites as 2 Stupid Dogs, Dexter's Laboratory, The Powerpuff Girls, Samurai Jack, The Grim Adventures of Billy & Mandy and Star Wars: Clone Wars. He also got to work with other animation legends such as Rob Renzetti and Craig McCracken. He even did the storyboards for Jon Favreau's Iron Man 2. 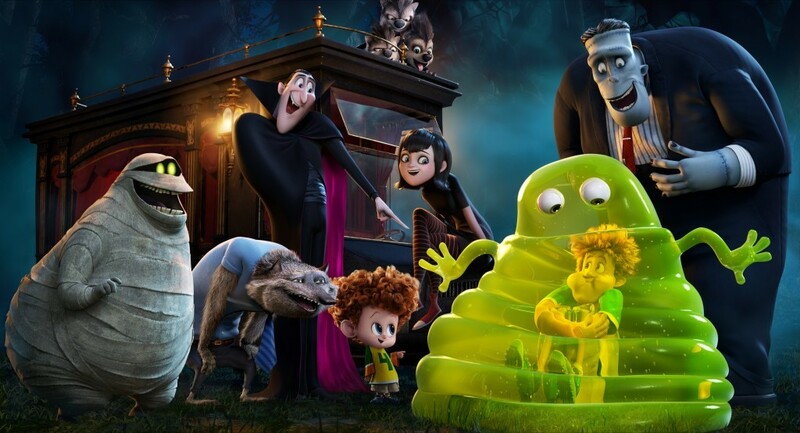 The man has one several awards for his works but this is only his second full length animated feature after Hotel Transylvania which is sort of amazing considering all that he's done and achieved. After all how many of you still remember fondly The Powerpuff Girls or Dexter's Laboratory? Heck, I still remember 2 Stupid Dogs. Also back for the sequel is the writer of the first, Robert Smigel. This man knows funny, he's an SNL alumni (he worked mostly as a writer but occasionally would show up in sketches), he's worked with Conan O'Brien on his show as his head writer but his most famous work is for something that you didn't even know he was responsible for, Robert Smigel is the foul-mouthed puppet Triumph, the Insult Comic Dog. If you don't know who he is go ahead and look him up on Youtube, I'll wait. So all signs point to a good sequel, right? 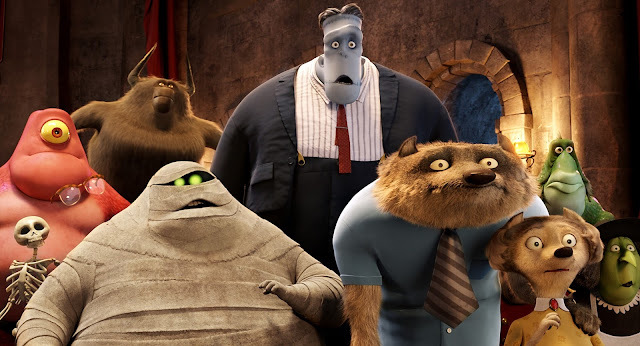 The same folks responsible for all the laughs in the first one are back in the second and most of the cast as well (the only one not reprising his role for the sequel is CeeLo Green who voiced the mummy in the first film). And the new additions to the cast include the legendary Mel Brooks as well as Nick Offerman as well as a bunch of SNL alumni. There's some seriously funny people involved in this animation. It's basically an SNL reunion except that you don't see them but hear them. Okay from this point on I'll be talking about the movie i.e. the story so I'm telling you now that there will be SPOILERS AHEAD!! YOU HAVE BEEN WARNED! The film picks up right after the events of the first one, if you remember Johnny (Andy Samberg) and Mavis (Selena Gomez) are in love and dad Dracula (Adam Sandler) at first tried to separate them but eventually and begrudgingly accepts their relationship. Now they're about to get married and Johnny's very normal human parents Mike (Nick Offerman) and Linda (Megan Mullally) have come for the ceremony along with a couple of relatives. Things go as well as it should. 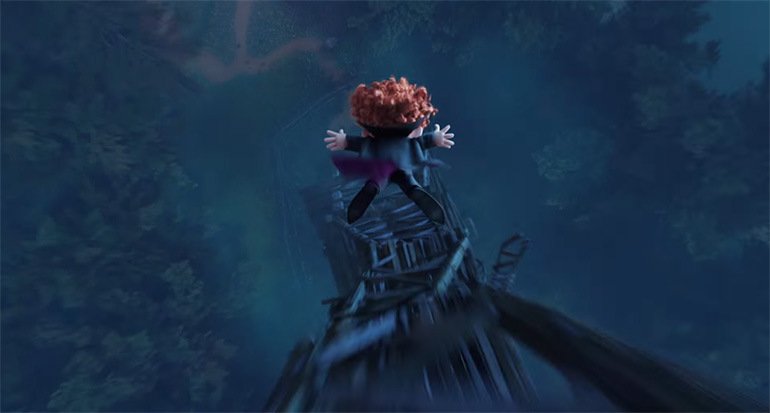 Fast forward and it's a year later and Mavis asks Drac if he'd like to go flying together since it's been awhile. Drac of course doesn't refuse since he dotes on Mavis and on this little airborne sojourn together Mavis tells him that she's pregnant. 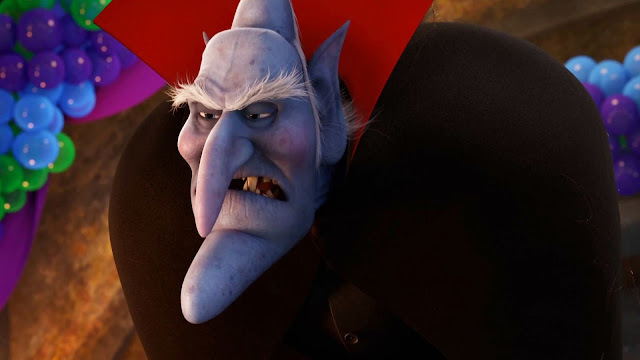 Drac is ecstatic and begins to count the days till his new grandchild arrives. Fast forward again and Dennis or Dennisovich (Asher Blinkoff) as Drac likes to call him is growing up fast but hasn't yet shown signs of becoming a Vampire, this worries Drac. According to legend or history or whatever it's called, if Dennis doesn't grow his fangs out by the time he turns five he'll never be a Vampire which means that Dennis will be human. Mavis on the other hand has become overprotective of Dennis and begins to feel that growing up around monsters might not be the best or safest thing for him especially since it's becoming apparent to her that Dennis may never grow out his fangs and become a Vampire. Soon she's talking about moving to Santa Cruz where Johnny grew up so that Dennis can grow up safe and be normal. Johnny being Johnny doesn't tell her that he'd rather stay and live at the Hotel. Upon hearing this Drac decides he needs to do something quick, that he needs to accelerate Dennis's transition. If Dennis becomes a Vampire then he can stay at the Hotel. So he calls on Dennis one evening and lays out his plans. The plan is for Johnny to take Mavis back to his home town to show her around and give her an impression of what it would be like to raise Dennis there, he's supposed to show her around and and have fun but not so much fun that she'd want to move there with Dennis. So the day comes and Johnny and Mavis are all packed and ready to head to Santa Cruz for a couple of days. Dennis on the other hand is going to stay back and hang out with VampPa Drac and his friends. Except that that's not what's going to happen, Drac's planned out all sorts of activities for Dennis, he plans to show him what being a monster is all about with the help of Frank the Frankenstein monster (Kevin James), Wayne, a werewolf (Steve Buscemi), Griffin the Invisible Man (David Spade) and Murray, a short fat mummy (Keegan-Michael Key). Also hitching along for the adventure ahead is Blobby (Jonny Solomon) an amorphous blob that looks like he's made up of lime jello. The plan is to have each of them show what it takes to become a monster like them by showing Dennis what their special skills are. But it's been a long time since they've been real monsters and they've been living among humans for so long that Dennis isn't learning anything. Their trip eventually ends up at Camp Winnepacaca (I think that's what it's called) a camp where young vampires learn how to become good bad vampires. Unfortunately for Drac the camp has moved forward with the times and the old ways are gone. Now the camp isn't even a shadow of it's old self. Everything is safe, proper and kid friendly so that parents don't sue the camp should anything happen to their child. But some of the old equipment is still around though and Drac and the boys take Dennis up to his old jump-off platform to teach Dennis how to fly. Except that it doesn't go as planned and the camp ends up in flames. Also everything is recorded by the camp kids and uploaded onto the internet which of course becomes viral. Back in Santa Cruz Mavis's enthusiasm for bringing Dennis to Santa Cruz and growing up there begins to drop somewhat when Johnny's parents attempts to make her feel welcomed makes her feel unaccepted. And wouldn't you know it right at that moment Johnny gets a message with the camp video attached. Mavis immediately calls Drac and when Drac does a horrible job at lying to her she tells him she's coming back right that moment. Drac and the gang immediately head back to the hotel. 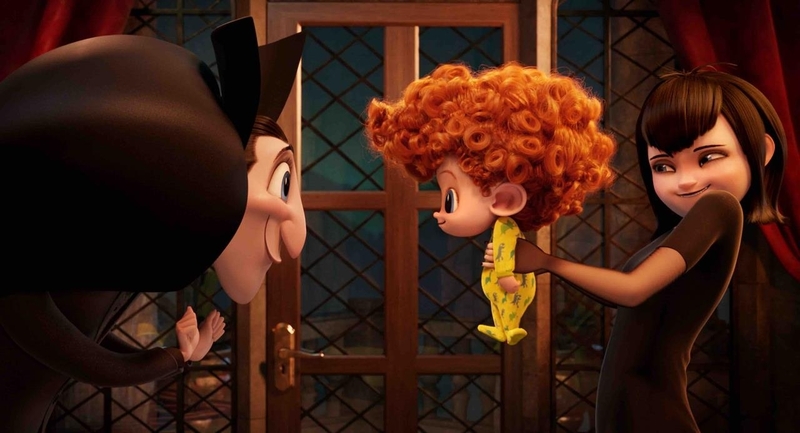 But Drac doesn't beat Mavis back to the hotel. Mavis now totally not trusting her dad with Dennis's safety tells him that just as soon as Dennis's fifth birthday is over the family is moving to Santa Cruz. He also tells him that Johnny's parents and their relatives will be coming along with Vlad, Dracula's father, her grandfather and Dennis's great-grandfather. This worries Drac as Vlad is completely old school and isn't as cool about being around humans as he is. The birthday rolls around and Dennis's fangs are still nowhere to be seen but the human relatives are. Knowing that Vlad would steal their souls if he knew they were human they tell Johnny's relatives that it's a masquerade/costume party, so the humans get dressed up as zombies. On the day itself Vlad (Mel Brooks) shows up and what's to see his great-grandchild but Drac tells his mates to distract him. It doesn't work. Try as they might to hide the fact that there are humans around and that Dennis may just turn out to be human Vlad decides to share his methods for turning Dennis into a vampire, the same methods he used on Drac. It doesn't work. Dennis runs out of the hotel never wanting to come back. As Dennis runs away he's accompanied by a werewolf pup named Winnie (Sadie Sandler) who's sort of has a thing for Dennis. Also on their tail is a friend of Vlad named Bela (Rob Riggle) who's also old school and wants to kill all the humans starting with Dennis. But all Bela does when he captures Dennis and Winnie and threatens them is awaken the vampire in Dennis. Dennis now gets to fulfill his fantasy of becoming Batman and starts to beat Bela into a pulp. When Dennis is done Bela is not exactly done for as he starts to call for backup. 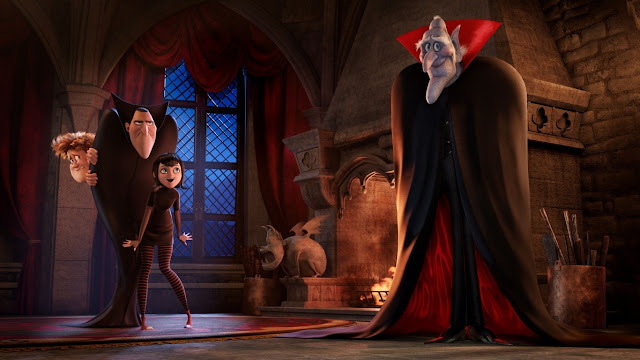 As Bela's backup arrives so does Drac, Mavis, Johnny and everyone else from the Hotel and a huge and hilarious battle ensues. At the end all's well that ends well. Dennis and his parents get to stay with Drac at the hotel and Vlad learns to accept his human family. This is the funniest movie that Adam Sandler's been in in a very, very long while. This is a very worthy sequel to the first film. Let's start off with the story. The main theme here is about acceptance. Drac accepting Dennis for who he is regardless of whether he grows up to be a vampire or not. 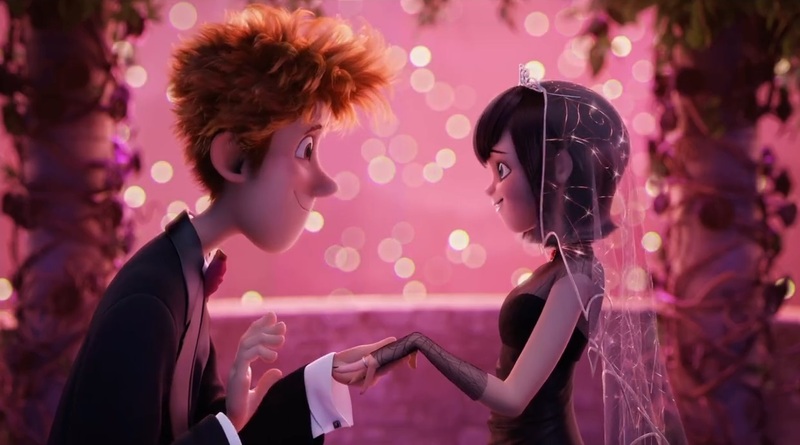 Mavis learning to accept that she can't protect Dennis from everything and needs to let things go once in a while and that where she grew up is the best place for Dennis to be a better person. It's nothing new but it's execution is done very well. The funny. I had a lot of fun watching this movie. It was silly, it was adorable, it was funny, it was punny. The jokes and gags aren't original of course well not all of them but the way they're done and delivered are just entertaining and hilarious. The relationship between the main characters and how they play off each other was fun to watch. The voice acting was just spot on. 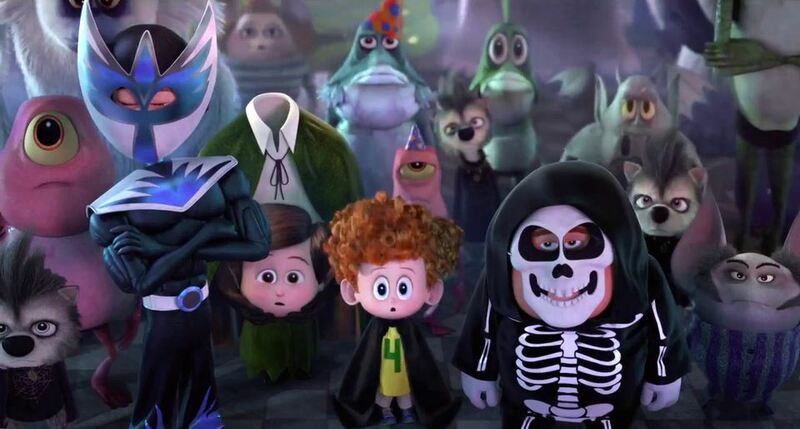 Then there are all the side characters all of them weird, quirky and colorful. The visuals have definitely improved but this movie isn't about the visuals it's about the characters who are all just a joy to watch and what's more Mel Brooks is in it, if you know who he is then you know why I mentioned him. This is a movie that the kids will really enjoy because of all the colorful and quirky characters but they're not the only ones who will enjoy it, there's enough here for even the adults that come along too. As I mentioned in the title a few paragraphs before it's the funniest movie Adam Sandler's been in in a very, very long time. And this movie will definitely mean we'll be seeing Genndy Tartakovsky's name more often. I'm going to give this fun and entertaining movie a solid 3.8 out of 5. The Minions movie is only slightly more fun than this one. When this opens go watch it whether you have kids or not. It's well worth the time and money. Check out the trailer, it's only a small sampling of how much fun this movie really is. 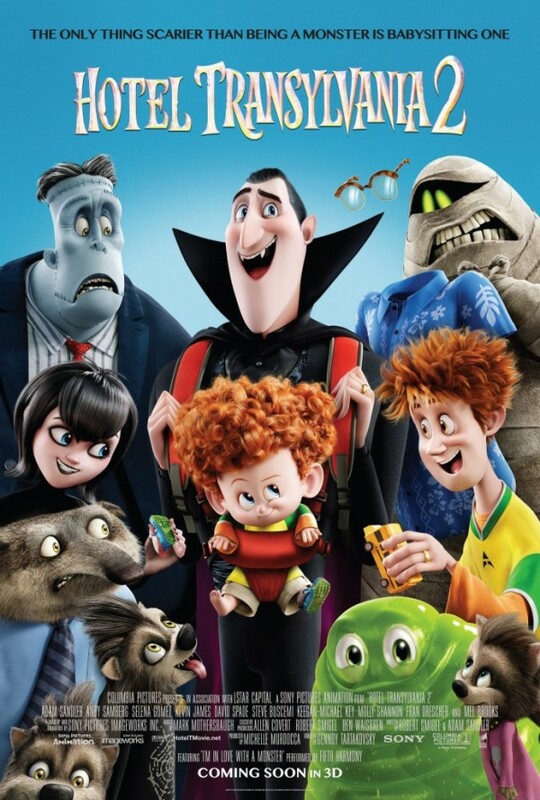 I HAD A LOT OF FUN WATCHING HOTEL TRANSYLVANIA 2 SO I HAVE TO THANK NUFFNANG AND SONY PICTURES ANIMATION MALAYSIA FOR GIVING ME #NNPREMIERESCREENING PASSES TO WATCH IT!! ALSO THANK YOU GSC CINEMAS @ 1 UTAMA FOR HOSTING US ALL!